308 pages | 60 B/W Illus. 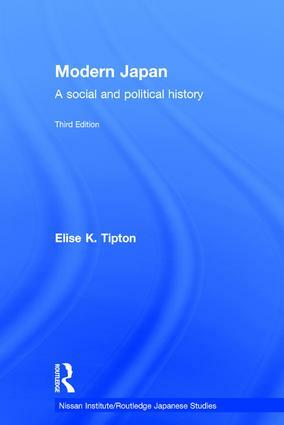 This thoroughly revised and updated third edition of Modern Japan provides a concise and fascinating introduction to the social, cultural and political history of modern Japan. Ranging from the Tokugawa period to the present day, Tipton links everyday lives with major historical developments, charting the country’s evolution into a modernized, economic and political world power. Drawing on the latest research, the book features new material on the global financial crisis, the Fukushima nuclear disaster and continuing political instability. While retaining analysis of women's issues, minorities and popular culture, this third edition's expanded coverage of Japan's role in the Second World War, life in the empire and the history of science, medicine and technology contributes to a sense of the complexity and diversity of modern Japan. Including an updated chronology, glossary and guide to further reading, as well as new maps and illustrations to help students to engage directly with the subject matter, this highly accessible and comprehensive textbook is an essential resource for students, scholars and teachers of Japanese history, politics, culture and society. Elise K. Tipton is Honorary Associate Professor of Japanese Studies at the University of Sydney, Australia.